Apple is allegedly preparing “an army of new products this fall.” Chief executive Tim Cook met with Store Leaders to discuss a number of issues and left them confident in the strength of Apple’s upcoming fall lineup. Cook organized the meeting in an attempt to boost iPhone sales through Apple Stores. While Apple’s iconic modern glass-decorated stores are extremely efficient in selling MacBooks and iPads, they only sell around 20% of the total number of iPhones sold. The remaining majority of iPhone sales happens via carriers and other channels. Apple however wants to change this as it considers the iPhone an important gateway into the company’s other products as people who buy it are more likely to buy other Apple devices as well. Interestingly, we are already seeing the first fruits of that effort in Apple’s just launched Back to School promo campaign offering a $50 gift card towards iPhone purchases for students. The other element of Apple’s strategy to raise awareness about Apple Stores as the best place to buy an iPhone is a trade-in program that is set to launch in the near future. It could also include incentives towards a new iPhone purchase for those that come in store with a damaged handset. Another topic that Tim Cook discussed with Apple Store Leaders was allegedly a rumor that carrier stores provide incentives to employees to sell devices other than the iPhone. Since Apple cannot do much about this, it is instead concentrating more efforts on selling devices in its own stores. 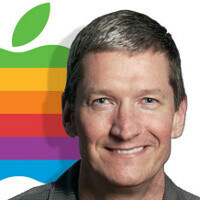 Cook also spoke about how hugely important iOS is to the company’s future. But the most important piece of news here is the fact that Apple is all ready to ship a brand new selection of iPhone, iPad and Macs this fall. Exciting, isn’t it? Means there's a pot of gold at the end. I actually do like the rainbow logo, that when I use the Apple IIe when I was a toddler. Bring back memory. Karataka. Yeah...they don't. A lot of people like the S3, a lot don't. The S4 sold a lot slower than the iPhone 5. I work in a wireless store I get a lot of people saying the the S3/4 is too big for a phone (never mind the Notes). How do people not like the S4 over the S3. The overall chassis footprint is smaller on the S4. But get a larger screen size. Win win. Strange, the S4 is roughly the same size, just bigger screen. You sure you don't work in an Apple store? Thanks Apple,my mom and dad will be very delightful with this announcement. My grandparents might be interested as well. So will I, and most of the young adults I transport daily. I'm sorry but 3 products don't make an army. great data... ok how about flagship device to another... lets say iphone 4s and S3??? samsung sell plenty of phones... maybe try compare the sales of 4s to S3, and 5 to S4? 3 products selling 100,000,000 units = army. And you'll be buying all 3 secret apple fan. You love apple, but are afraid to say so cuz u fear the android nation backlash, and u know it. The only way anyone can cause me to buy an Apple product is for Android somehow magically disappear. Not gonna happen. Ever. Stop your fibbing. I'm not new to this site? I know the real. Shhhh, it's an "army of one." So it will be: a new iphone a cheap iphone a new ipad a new ipad mini a mac book the i-watch (if they get the trademark for it) and maybe some other product that we dont yet know about. Since when did an army comprise of 7? its being made by an army of Foxconn workers, so maybe that counts? Did Apple. Invented the smartphone? Wtf. I admit Apple. Make a iPhone to got famous cuz of nice apps but there waren smartphone already out there + this was a matter time to people could really appreciate a smartphone the way to touch screen apple used was a of the principal features to people love. But sad not everybody knows what really innovation is.